Near the gate came further intimations. The ladies restroom my wife entered had only a single cabin, which was locked. As she exited a large white woman standing nearby spoke: “I’ve been waiting outside, excuse me!” No one could have known this before entering the restroom, but my wife was too stunned to respond. Then, another woman sitting a little away came up and said, “I’ve been waiting too!” This woman’s accent also was American, and (my wife concluded) so was her attitude. In the moments of emotion that follow an unpleasant social encounter, my wife and I agreed that people of that country seem to carry a sense of entitlement wherever they go. Displaying this inside the US was bad manners; outside, it was comical. My wife wondered if we would visit the US if her parents were not living in the country. Probably not, I said. Not a propitious beginning to a three week vacation in the US. But things only got better from here. New Jersey is densely populated, but the state has stretches of uninhabited land with the occasional mansion standing like a lighthouse in the middle of a verdant sea. There are also built-up areas with large houses bounded by lush lawns and a small tree planted, consistently, every few meters. My in-laws live in one such neighbourhood, in a house facing a cul-de-sac. The building is set ten meters from the road. A brick tiled path, with a small garden on either side, leads to the front door. Behind the house is a large deck, which leads down to a backyard that could hold an olympic size swimming pool. Half a dozen trees are scattered around its edges, and behind them are more trees that form a thin stretch of what probably was dense forest before the developers moved in. The woods widen towards the south, and it is from this direction that deer come in the evenings, entering the backyard to graze. 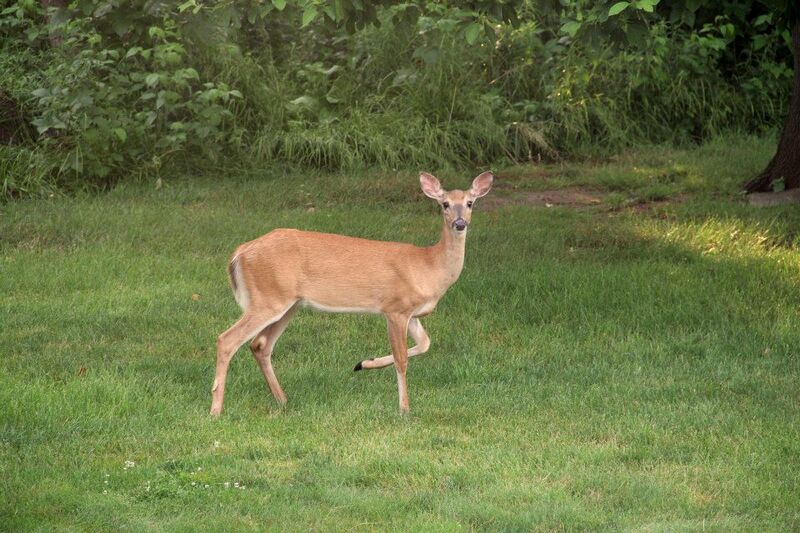 In three weeks I saw deer on seven separate occasions. Once, when a pair stood a few meters beyond our fence, I walked to the edge to get a closer look. Spotting my presence they stalled, and looked up at me, head turned perpendicular to the length of their bodies. Walking slowly, I stopped near the fence and held myself still. For half a minute we looked at each other. There was no sound but of wind worrying the trees. The stag had begun to grow antlers, not yet bone but soft and velvety. The doe, smaller in size, looked more worried than curious, and she was the first to walk away. The stag followed, turning behind to look at me every few seconds, until both settled on a patch of dried grass a hundred meters away. Rabbits dart across rhubarb patches, squirrels hop between pines and oaks, hedgehogs trudge through bushes, birds in various guises appear and disappear, and the rattle of a woodpecker briefly breaks the silence. At dusk fireflies begin to flicker, and later, after dark, the stars come down to dance. The house is ideal for what the Japanese call hikikomori: the practice of shutting oneself inside. Without a car one can go nowhere. A walk outside leads only to the built-up area (the woods behind the house have no path), where the wide, deserted street lined with elegant mansions and immaculately manicured lawns appears like a model street in Hollywood. The nearest shopping area is four miles away. In Europe, such places are an escape from the city, an ideal vacation spot. I was on a vacation, and while I loved the spacious serenity of the house and its deer-friendly neighbourhood, there were moments when I craved for human activity. At such times, I would ask someone at home to ferry me to the library or to a Barnes & Nobel outlet, or drive there myself. The conversation began as conversations usually do: with an exchange of biographical trivia. A slow accumulation of details revealed a typical Indian immigrant family in the US. Originally from Tamil Nadu; moved to the US at age eight; works in New York, in investment banking; two sons and a daughter; lives in Jersey City; husband in the IT sector; parents living in Austin; in-laws in India. She was traveling to attend a graduation party of her husband’s niece, who lived on the US west coast. Their family is obviously very well off, she said, to invite relatives and friends from the US and Canada for such an event, all expenses paid. The niece’s parents were doctors, and doctors living in small towns earned a lot. The family even owned a Rolls-Royce. She worked in Wall Street, so I asked her about Occupy Wall Street. I cross the protestors on my way to work each day, she said. There was no question of guilt: if those folks chose to study arts or humanities while she chose economics, why was she to blame for the difference in their incomes? And it wasn’t as if she had an easy going life. She worked hard every day, waking up at 5:30 am, getting the kids ready, commuting to work, returning late, and taking care of the kids again. Each day was tough, and she earned what she worked for. Why should she care if they earned less? We spoke about visits to India. Unlike me, she had never spent more than a month in the country; her viewpoint was that of a tourist, or a Westerner. This became clearer when we spoke of a possible return. (Immigrants eventually reach this point in a conversation: returning home is a subject on every immigrant’s mind, no matter the mind is made up or not.) Her husband, who had grown up in India, could imagine a life back there, but to her this was inconceivable. When I suggested that life in India these days could be as comfortable as in the US (or even more, given that one can keep a full-day maidservant and full-time driver), she looked skeptical. What about money? she asked. I answered that people in India can earn a lot; entry level salaries may be lower in comparison, but a middle management job in a multinational company can pay very well. She countered this with an example. She owned a Porsche Cayenne, an SUV that cost sixty thousand US dollars, about thirty five lakhs in Indian rupees — could she afford this in India? Probably not, she answered herself. She carried many dreams for her daughter. She wished her daughter would do all the things she could not as a teenager: own a car, travel where she wanted, wear miniskirts (at this point I think I stopped listening)… How can such dreams be realized in India? she asked. Her mind was made up: the US was home. As the plane descended into the Los Angeles Orange County airport, I asked her if they intended to take a rental car. No, she said, her relatives were sending someone to pick them up. Will they send the Rolls Royce? I asked. She smiled, shaking her head. Later, I spotted her at the end of the Avis car rental queue. I walked further, to the queue behind Alamo, the agency where we had a reservation. At the counter a curious exchange followed. The man with a Morrocan name I can no longer recall wondered how we could carry an Indian passport and have a German driving license. Your passport must match the driving license, he said. He telephoned his branch manager to confirm if it was okay to rent the car to a client who did not meet such basic criteria. The branch manager could not be reached, and after some deliberation he consented. We packed our luggage into a Volkswagen Passat (what could trump a reliable German car in an unfamiliar land?) and drove to our hotel near Universal Studios, Hollywood. Yes, only a woman. It’s different with men. Maybe because his interest will move from the conversation to the woman (won’t happen with a man). There is an ominous silence, Porcupyn. What do you suppose it means? Well, the interest is always on the person, man or woman, not the conversation! Why does everyone want to relive their life vicariously through their children? Your children are not a younger version of yourself…what if the daughter did not want to do the things her mother prized so much ?